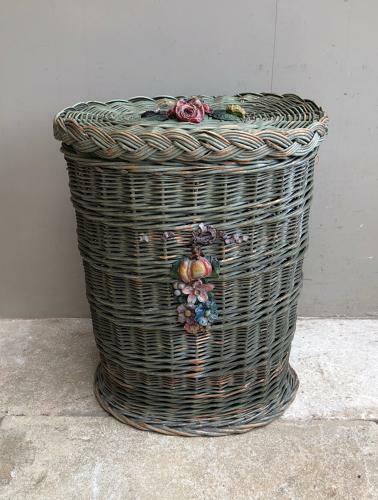 Dating to the Early 20th Century this is such a pretty Landry Basket with its Original Lid. In its original paint with gesso floral front and top. If you remove the lid it does make a good large waste paper basket for a restaurant loo etc.. It will also hold umbrellas and sticks etc.. If I get a large box I can post this Parcel Force 48 for £15 plus the box at £4.95 so £19.45 total.